Take the director of The American starring George Clooney and source material from iconic author John Le Carre, the man who wrote Tinker Tailor Soldier Spy, and you've got a gorgeously shot, quiet, slow-burning spy thriller. A Most Wanted Man takes a team of off the grid German intelligence spies, reminiscent of the Impossible Mission Force without all the bells and whistles, and contrasts them with the impatient American government agencies who just want someone to blame for any sort of terrorist activity. But the plot at the center of this thriller from director Anton Corbijn isn't an impending terrorist attack. Read on! 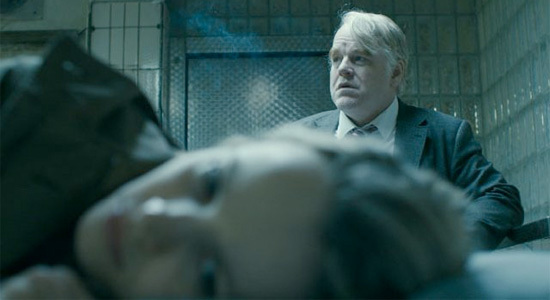 Philip Seymour Hoffman leads a small intelligence outfit in Hamburg, Germany, where the attacks of 9/11 were planned. A closer eye has been kept on the city since the infamous day in 2001, and Hoffman's outfit (which includes Nina Hoss and Daniel Bruhl) is tasked with tracking Issa (Grigoriy Dobrygin), a suspicious Chechen-Russian immigrant with Muslim beliefs on the run. While other German officials and the American CIA (represented by Robin Wright) want him to be immediately captured and interrogated as a terrorist suspect. But seasoned spy Gunther Bachmann (Hoffman) knows better, and turns the operation into a minnow, which will capture a barracuda, which will lead to catching a shark. While the film first feels like it will lead into some sort of cat and mouse game like The Bourne Identity, the audience stays firmly planted on the ground for better or worse. This film is not action packed, but it does contain some surprising amounts of suspense. It's slow, but without ever really dragging. The captivation really comes from Hoffman as Gunther and his grizzled, dry approach to what has become an everyday job; one that has been much more complicated ever since the Americans started interfering when going on full alert after 9/11. What little fragments we get about Gunther's personality and life add some charm to the character who has a warm smile, but a fierce intensity when it's time to get to work. As the operation continues and Gunther sets his sights on a bigger target, that's when things get a little convoluted. Rachel McAdams comes into play as a lawyer, or what Gunther calls a social worker for terrorists, and helps Issa sort out a large inheritance from his disgraceful father. All this leads to a chance at taking down a world-renowned Muslim philanthropist with ties to a terrorist group. However, McAdams' character doesn't really seem to have any purpose other than being a plot device. And her German accent (all the actors speak English with German accents), is weak when compared to Hoffman or Willem Dafoe as an integral banker in the larger scheme. The film is undoubtedly driven by Hoffman's leading performance, but Corbijn also shoots the film in some very pretty settings, making for some rather beautifully framed and lit shots. And while this isn't an action-packed spy thriller, there's still some excitement and suspense, not to mention a couple twists and turns that aren't shocking, but still pack a punch. But the film is moreso making a statement about the impatience of an American government hellbent on stopping terrorism without really understanding how, and the need to give evil a face without a second thought. At the end of the day, A Most Wanted Man is most easily described as Michael Clayton meets Tinker Tailor Soldier Spy. Philip Seymour Hoffman puts in a reserved and understated performance that is essentially representative of the film as a whole. The film is more engaging than Corbijn's The American, and makes use of a solid ensemble cast without strutting too much star power. With an ending that feels like a punch to the gut, A Most Wanted Man is thought-provoking, solid drama, painting a grounded picture of real spies that is usually ditched in favor of car chases, explosions and gunshots. 1 Oscar is damn too low for Mr.Philip Seymour Hoffman , I wait for his next. Bruhl is a great up and coming talent. Looking forward.